Do you believe in ghosts and haunted houses? While I don’t, there is no question the team behind Ghost Hunters has created a compelling TV program around these so called haunted houses. It never hurts to have a way to visit these places. Who knows, they may make a believer out of you. 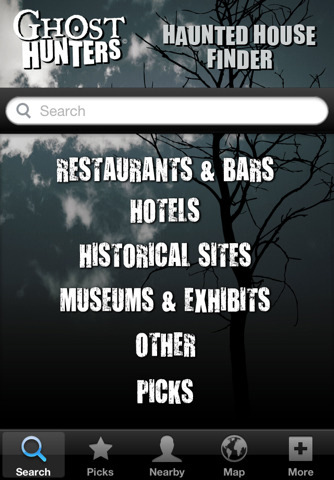 Haunted House Finder is a fun application that has over 100 places you can visit and search for ghosts. 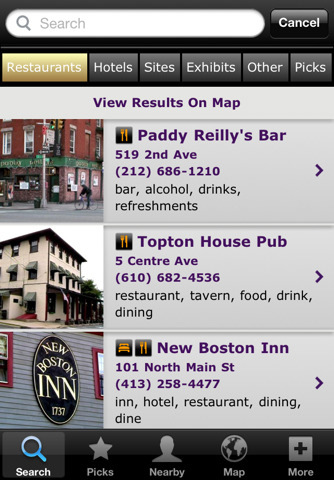 Haunted House Finder lets you search through restaurants, hotels, and historical sites to find a place to investigate by your own or with your team. The side information per listing in this app is nice to have. If you have followed Ghost Hunters on TV, you have probably seen some of these places already. This app can not only help you find your way to a haunted place featured on Ghost Haunters, it can be used to connect with other ghost hunters. The support for foursquare is not too shabby. Haunted House Finder is the perfect app for those of you who are a fan of Ghost Hunters series on TV or just want to visit a scary place. More listings would be nice though. It probably won’t find you ghosts (unless you believe in that kind of thing), but it’s nice to play with.